In the first week that I arrived to live in Beijing 4 years ago, I remember a friend showing me some stunning scenic photos on his DSLR camera. Emerald and turquoise waters, mountain peaks and lush green forest. "Where is that?" I asked, thinking Alaska, Yellowstone or New Zealand perhaps... "Jiuzhaigou in Sichuan, China" he answered. Thoroughly impressed that this country possesses such amazing nature, not something it is exactly well-known for, I added it to my China to-do list. Yesterday, dream became reality as we had a full-on day checking out this huge park. The nature reserve, setup in the 80's, is one of China's first and became a UNESCO world heritage area in 1992. The accessible park includes some 150sq/km out of the reserve's total 700ish sq/km. It sits at 2,000 - 4,000m altitude and is home to boatloads of animals and plants including, most significantly, pandas!!!!! We followed a recommended route which, for those who are planning a trip, is listed at the bottom of this post. We found it worked very well. Follow us through the highs and lows! Rising at 6am to complete darkness, throwing down some Chinese street breakfast, we grabbed our well stocked snack bags and headed for the park entrance. Two lessons in China are bring plenty of snacks (which my trusty Chief of Snackiness, Line Fricke, always thoroughly prepares) and start early for any chance of minimising the inevitable crowds. It was a misty, grey and slightly rainy morning. The low clouds filled the valleys and drifted around the mountains, creating a dramatic atmosphere. We were hoping for the clouds to part later in the day like yesterday, but unfortunately it covered the park all day. The beginning was very enjoyable and fairly quiet, especially in between the main touristy spots. Most people took the shuttle buses around so not many other visitors were on the boardwalk in between the spots which were some of the best parts for us. Towards midday we had been hiking for four hours past various beautiful lakes, waterfalls and shoals but unfortunately no pandas... Wet, tired and cold we sought shelter in the "tourist centre", devoured snacks and hot tea and recharged. The park's infrastructure is great with clear paths, signage and buses shooting around to all the spots. This is mass eco tourism. The afternoon was noticeably busier, especially around the arguably most famous features, Long Lake and Five Coloured Pond. 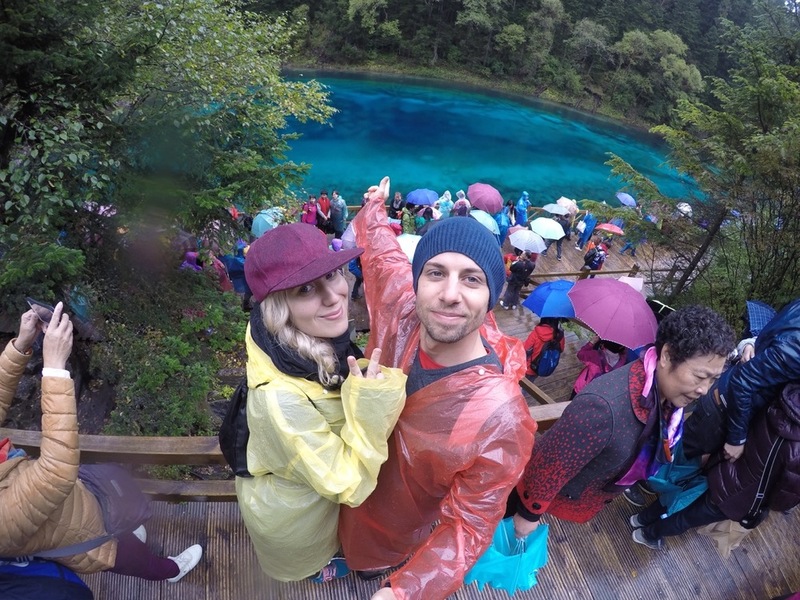 It was more like 50 colours with all the umbrellas and ponchos, but to be fair, remarkable scenery. Overall, I was impressed by the scenery, with so much in an accessible area and being enjoyed by so many other local tourists ... On the other hand, this is mass eco tourism, so keep your expectations of peace and quiet in check. Recommended for people travelling near this part of China or for urbanites looking for an escape from the city - although you won't be escaping crowds. A recommended route thanks to TripAdvisor and the Nature reserves own great website. Start at 7am when gates open (we picked up tickets in advance the day before). Take bus heading up Rize Valley for Virgin Forest. Get off at Bamboo Arrow Lake and walk down the valley on the inside path past Panda Lake and waterfalls, Five Flower Lake, Pearl Shoals, Mirror Lake arriving at Nuorilang Waterfalls. Takes about 4 hours at average speed. Snack/lunch break at the Tourist Center. Then take shuttle bus up to Long Lake and Five Coloured Pond. Take bus back down and visit Rhinocerus Lake to Bonsai Shoals and vilłages in the bottom of the valley if you have time. Cost: entrance ticket is 310rmb for one day including bus pass. Getting there: we flew from Shanghai straight to Jiuzhaigou Huanglong airport (see previous post here). Buses run from other towns and cities like Langmusi: 4-5 hours, Lanzhou (Gansu): 9-10 hours, or Chengdu (Sichuan): 9-10 hours.